Cookie Dough Counter, Stacker, Auto-loader automatically counts sheets of cookie dough and loads them into a poly lined case. The model shown is capable of two lanes and has an overall operating width of 32.5″. The system does not require cases and is capable of stacking directly onto the exit belt and is easily interfaced with a downstream wrapper or bagger. Single lane and fully customized systems are available. As with all of our solutions our 24×7 service department is available to install, service, and maintain our equipment. 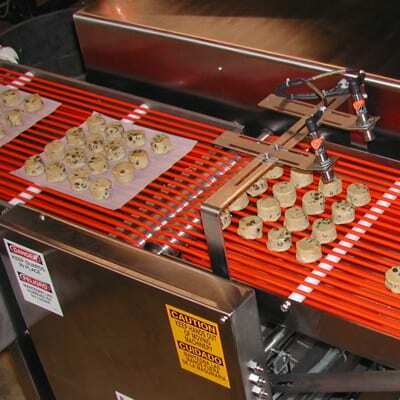 Choose the Pacproinc® PPI-200 to reduce manual labor required for stacking and case loading of layer pack cookie dough at rates of up to 60 portions per lane. Pacproinc® stackers/case loaders place cookie dough directly into cases or onto stacker discharge belts to feed wrappers. Systems are available in single- or multi-lane configurations and can be integrated directly with automatic wire cutters and dough depositors. We offer customized configurations to fit your case dimensions, and all Pacproinc® products are designed and manufactured to reduce human contamination and repetitive motion injuries while ensuring correct quantities per case. The Pacproinc® PPI-200 line of interleavers accurately and consistently places a pre-programmed sheet of paper, film, or foil under or around your product at speeds up to 600 pieces per minute. The PPI-200 product line is a sanitary, washdown-duty, stainless steel system. The streamlined design incorporates leading-edge Programmable Logic Controller (PLC) and servo motor technology, ensuring low maintenance and long machine life. With compact designs available, the PPI-200 requires a minimal amount of floor space and is engineered to exceed the American Meat Industry’s 10 Principles of Sanitary Design.